Sharpen all types of serrated edges! No other sharpener does that! 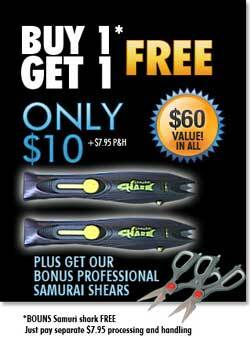 Offer Details: Buy 1 Get 1 FREE: 1 Samurai Shark for Only $10.00 + $7.95 S&H. Bonus Samurai Shark FREE. Just pay additional $7.95 processing. Cutting boards, counters, plates and dishes - all of these things dull your knives. But the Samurai Shark uses tungsten-carbide steel sharpening blades and a unique angle to give your knives, scissors, tools and anything wih a cutting blade a razor sharp, precision edge every time you use it! And, the Samurai Shark’s retractable sharpening blade allows you to easily sharpen all types of serrated edges! No other sharpener does that! Store one in your garage or workshop to sharpen tools or garden shears; keep one in your tackle box for filet knives or hunting. The Samurai Shark is handy just about anywhere!